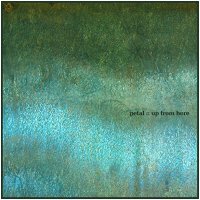 Jon Wheeler of Petal returns to Earth Mantra with another collection of poignant and supremely creative ambient music called Up From Here. Fans will remember Petal's previous Earth Mantra foray, called The Last Season, something that prompted us to label Jon as "one of the most creative and ingenious ambient artists active today". With Up From Here, Jon takes his music to an even higher level, retaining his breathtaking fusion of Americana and dark ambience, but adding an even more potent dose of bittersweet reminiscence, with even stronger visuals and evocative themes. Where his previous release blended Jon's various influences seamlessly, with Up From Here, the fusion is so complete that one cannot say with certainty where one influence ends and another begins. It all forms one inseparable innate whole, an assembly of fascinatingly articulate ambience unlike anything else we've heard. In fact, atop the obvious ambient structure, we would also call this music post-gospel. Not the kind of slick gospel that comes at you from a Hammond B3 or a Wurlie and a polished Stratocaster, but more like Libba Cotten Piedmont gospel, shuffling off into the twilight with two chords and no answers. Simple, sweet, plaintive and sad with the sadness you get when you hit bottom, hopeful with the hope that it's all up from here. Really profound stuff that hits home on multiple levels. As usual, Jon's process is almost as interesting as the music itself. For many of the pieces, he recorded string band quartet and quintet versions live, straight into the computer, and then decomposed them into ambient arrangements. Others, like Run to the Rock were improvisations that happened in the spur of the moment. Regardless of how he created it, the work stands tall on its own, the kind of ambient music that crosses so many boundaries that nearly everyone will find something to love. So, with great pleasure, Earth Mantra proudly unveils Up From Here, the latest work by Jon Wheeler of Petal. One of our favorite releases, and certainly one that we think our audience needs to hear. Highly, highly recommended. Really nice music. Thanks for creating this magic, I cherish it!